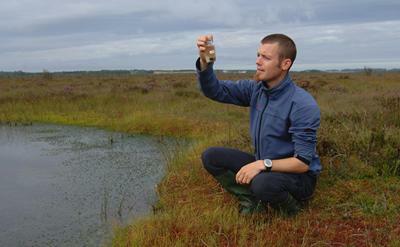 Dr Bjorn Robroek conducting his research in a European peat bog. 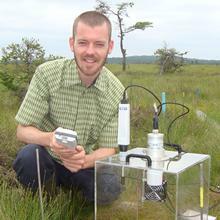 They account for just three per cent of the Earth’s surface but play a major role in offsetting carbon dioxide emissions – and now a team of scientists led by the universities of Southampton and Utrecht has discovered that the plants that make up peat bogs adapt exceptionally well to climate change. In a study published today in the journal Nature Communications, experts show that, even though certain species in a peat bog’s plant ‘community’ might disappear because of the effect of rising temperatures and increasing levels of atmospheric sulphur and nitrogen, their place will be taken by other species with different environmental preferences but a similar biological ‘function’. Dr Robroek, who led the collaboration involving universities across Europe, said: “While studies of other plant communities have shown that environmental change has a negative effect on species richness, the effects on peatlands seem minimal. In other words, peatlands seem rather resilient in the face of environmental change, with species replacing each other to create different compositions in the plant community. The research was funded as an ERA-net project within the European Union’s 6th Framework Programme for Research through the Netherlands Organisation for Scientific Research. The Dutch Foundation for the Conservation of Irish Bogs funded part of this study. Bjorn Robroek joined Biological Sciences in late March 2017 as a lecturer in Plant Ecology and Biodiversity. His research focuses on the interactions between plant communities and belowground (microbial) communities, with a special interest in the effects of environmental change on plant-soil interactions.